Although the only thing that should ever go down your kitchen drain is liquid and the only thing that should really go down your toilet drain is toilet paper, the majority of people tend to treat their drains as garbage bins. While this doesn’t end particularly well for homeowners (think nuisance clogs and costly plumbing system repairs), it does make for some interesting reading material! Before we get on to some of the weirdest things that have ever been found in drains, let’s quickly discuss the importance drain cleaning. Drain cleaning is important because it prevents future plumbing problems. For high-traffic areas like kitchen and bathroom sinks, drain cleaning should occur on a monthly basis. 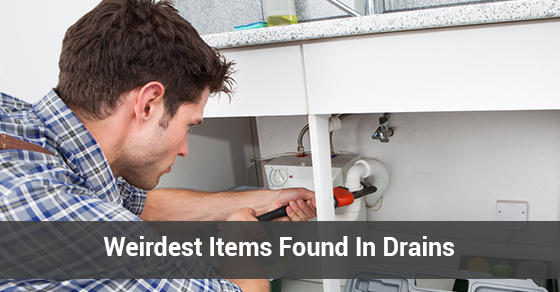 For drains that are rarely used, cleaning them twice a year should suffice. Consult a professional for high-quality drain cleaning services in order to prolong the life of your plumbing system as much as possible. Scottish authorities retrieved a fax machine from their sewers once upon a time. Finding alligators in sewers used to be thought of as an urban legend, but we now have the photo evidence that these occurrences are indeed real. While this isn’t necessarily weird, it is certainly shocking! In fact, alligators in sewers are reportedly a common occurrence in Australia, and they have also been found in different parts of the US, including Florida and Texas. A cow was also once found in a sewer in China, alive and well! If you are in need of professional drain cleaning services, contact Brothers Plumbing today. We are one of Toronto’s leading plumbing providers, with over 50 years in the industry. Our services are available at very affordable rates and at a time that is right for you. Our drain cleaning services begin with an extensive inspection of your plumbing system.